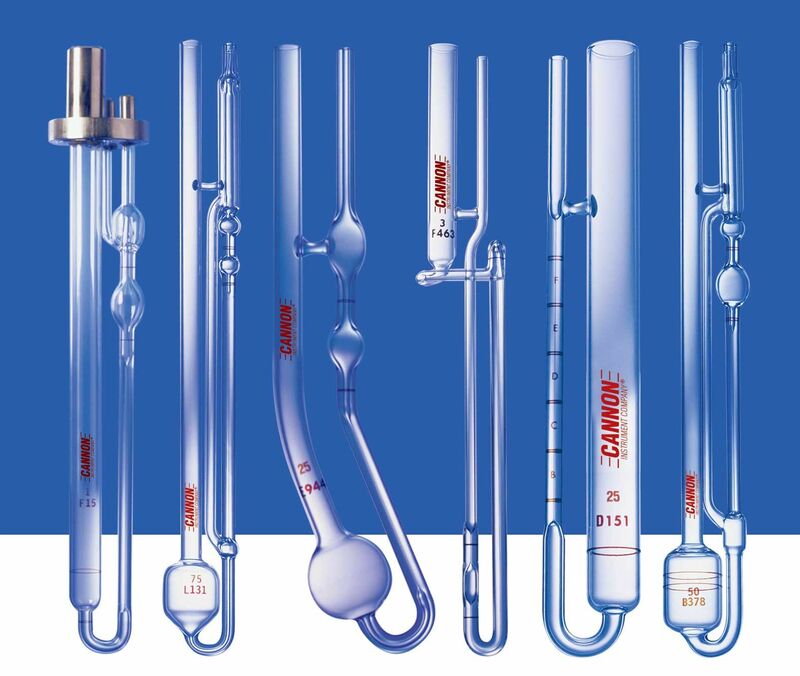 Why does Cannon offer so many different types of glass capillary viscometers? Primarily because no single capillary viscometer is ideally suited for all kinematic viscosity determinations. Individual analysts also have their own preferences. The brief descriptions on the following page may assist you in determining which viscometer is most appropriate for your particular application. Instead of listing the precision of Cannon glass capillary viscometers, we now provide the expanded uncertainty. This is the universally accepted statistic when dealing with calibration data. In order to obtain A2LA accreditation, it is necessary to determine and specify the expanded uncertainty. The use of expanded uncertainty instead of precision does not reflect any change in the accuracy or quality of Cannon viscometers. It is a statistical term that is more comprehensive than precision. When comparing the accuracy of viscometers it is essential that the expanded uncertainty be specified. A certificate specifying the expanded uncertainty is provided with every calibrated viscometer. We also supply such a certificate with every bottle of viscosity standard. The Cannon-Fenske Routine viscometer is a rugged and inexpensive viscometer that works well if the liquid to be measured is transparent or translucent. In general, if the meniscus (the curvature at the top of the liquid column) can be readily observed through a column of liquid 3-mm in diameter, the Cannon-Fenske Routine viscometer and other transparent-type viscometers (such as the Zeitfuchs Transparent and BS/U-Tube viscometers) can be used. The Ubbelohde viscometer and other supended level viscometers are also used to measure transparent liquids. Unlike the Cannon-Fenske Routine viscometer, suspended level viscometers possess the same viscometer constant at all temperatures. This property is advantageous when measurements are to be made at a number of different temperatures. CANNON has improved the design of the Ubbelohde viscometer to make a more rugged instrument called the Cannon-Ubbelohde viscometer. Other suspended level viscometers in this bulletin include the BS/IP/SL, BS/IP/SL(S), and BS/IP/MSL viscometers. Special viscometers have been designed for testing opaque liquids. These reverse flow type viscometers wet the timing section of the viscometer capillary only during the actual measurement. The Cannon-Fenske Opaque, Zeitfuchs Cross-Arm, and BS/IP/RFU-Tube viscometers available from CANNON Instrument Company are all reverse flow types. Reverse flow viscometers must be cleaned, dried, and refilled before a repeat measurement can be made. By contrast, other viscometer types commonly used to measure transparent liquids allow the sample to be repeatedly drawn up into the capillary, permitting duplicate measurements. In some situations, such as in a clinical laboratory, the amount of liquid available for measurement is quite small. Several viscometers have been designed which require one milliliter or less of liquid. These are refered to as semi-micro or micro viscometers. The Cannon-Manning Semi-Micro is a U-tube viscometer that has been modified to measure the kinematic viscosity of samples as small as 1.0 mL. The Cannon-Ubbelohde Semi-Micro viscometer is a modification of the standard size Cannon-Ubbelohde viscometer requiring a sample volume of only one milliliter. The Cannon-Manning Semi-Micro Extra Low Charge viscometer will permit kinematic viscosity determination with as little as 0.5 milliliters of sample. Estimates of the molecular size and shape of large polymer molecules can be obtained from kinematic viscosity measurements of dilute solutions of the polymers. The Cannon-Ubbelohde Dilution viscometer has an extra-large reservoir which allows polymer solutions to be diluted several times. Dilute polymer solutions frequently appear to exhibit changes in kinematic viscosity when the shear rate is changed. By using the Cannon-Ubbelohde Four-Bulb Shear Dilution Viscometer, measurements can be made at four different shear rates. In most glass capillary viscometers, the samples flow under gravity. When liquids are too viscous to flow readily under gravity, vacuum viscometers may be used to measure viscosity (in mPa•s or cP). In these instruments a vacuum is applied to one end of the vicscometer to pull the liquid through the capillary into the timing bulb(s). CANNON offers several type of vacuum viscometers, including the Cannon-Manning Vacuum, the Asphalt Institute Vacuum, and the Modified Koppers Vacuum. Like the Cannon-Fenske Opaque viscometer, these are all “reverse flow” viscometers. Vacuum viscometers require a vacuum that is very accurately controlled.